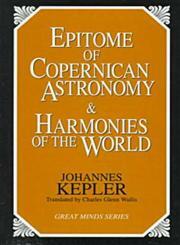 The Title "Epitome of Copernican Astronomy & Harmonies of the World (Great Minds Series)" is written by Johannes Kepler . This book was published in the year 1995. The ISBN number 1573920363|9781573920360 is assigned to the Paperback version of this title. The publisher of this title is Prometheus Books, Publishers. We have about 2462 other great books from this publisher. Epitome of Copernican Astronomy & Harmonies of the World (Great Minds Series) is currently Available with us.